The re-location of government establishments has raised urban lands for large scale flagship investments while making it a good source of capital formation and re-location and development of modern settlements, Treasury Secretary Dr P.B Jayasundara said. The restoration of archaeologically important buildings have created new investment avenues for the private sector. Investments in flood protection and clean green city concept have improved the business outlook in cities and living environment in urban settlements. Firm investment commitments so far has recognized the investments under strategic investments law, and now it exceeds over $ 2000 million. In addition investments under normal tax law is of around $ 500 million.The restoration of archaeologically important buildings have created new investment avenues for the private sector. Investments in flood protection and clean green city concept have improved the business outlook in cities and living environment in urban settlements. 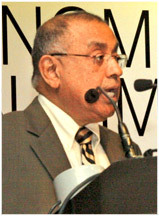 The Sri Lanka Economic Summit 2013 was inaugurated at Cinnamon Grand on Tuesday. Here Suresh Shah, Chairman of the Ceylon Chamber of Commerce is presenting at a token of appreciation to Anoop Singh. Dr Sarath Amunugama, Senior Minister is also in the picture. Picture by Wimal Karunatilleke. Dr. Jayasundara said the country is making efforts to accelerate trade or development while managing deficit reduction path and their vulnerability to secure stability further. Sri Lanka also expects to maintain a 5.8 percent budget deficit target with better tax revenues in the second half of this year and continued moderation of current expenses, Over time, tax holidays will also be running out and will not be renewed. Commenting on the loss making state enterprises, Dr. Jayasundara said, “Ceylon Petroleum Corporation still subsidises the private industries and service in addition to lower segment of electricity consumers. The price of diesel remains below cost while recent adjustments are expected to reduce losses of CPC and Ceylon Electricity Board significantly this year. IMF Resident Representative in Sri Lanka , Dr.Koshy Mathai said “We can see a trend towards the reduction in debt ratio due to government efforts to reduce the deficit that is running each year. However, over the last 20 years, the revenues in the country have not been enough to finance even the current expenditure that we have, so our borrowings are financing not only our capital investments but also the current consumption. Though the overall borrowings are reducing; Sri Lanka is still in a relatively weak position, but things are improving in the recent past, he said.